Dazzling Copper-red glazes has throughout the history of Chinese porcelain been somewhat of the most sought after and at the same time, most difficult to achieve. During long period the carefully protected secrets of making them has turned out to be too well protected and the art has been lost. Because of this different red glazes has been invented and reinvented in the Chinese ceramic history - all with different names despite their superficial similarities. What brings them together are the fact that the glazes are all containing copper which turn red when fired in a reducing atmosphere. The earliest known copper-red glaze occurs on wares made in Shanxi during the Tang dynasty. Jun kilns of the Song dynasty commonly used copper glazes. The sacrificial xianhong of the early Ming dynasty and its Qing dynasty copies, the Qing dynasty jihong (same but of the Qing period), langyao hong (also called "Ox-blood" or "Sang-de-Boef", Peach-bloom and the Qing Jun red, which was really a monochrome red of the flambé type, are all copper based red glazes. The problem with all these glazes are that copper is very volatile and it is just very difficult to fire a glaze based on copper so as it turns out pure red when finished. The success rate of wares with specifically copper red glazes has up until today typically been very low. This 12 inches high (31 cm) vase is a "Langyao hong" (Langyao red, or a true "ox-blood"). They were a specific tupe developed under the supervisor Lang Tinji, active 1705-1712 at the Imperial kilns of the Kangxi period. 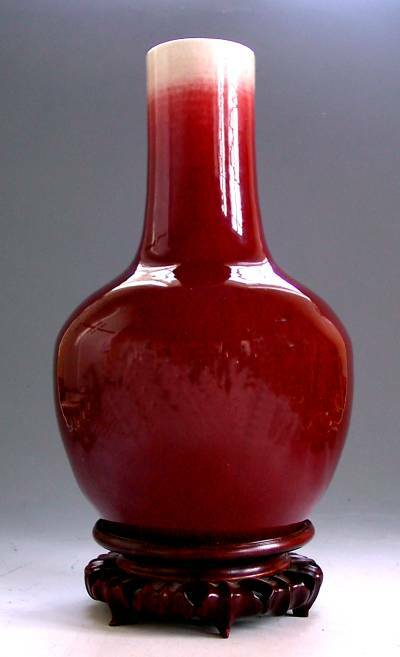 It is thus a Qing dynasty thick and vitreous bright red glaze, often featuring crackle or thick drops around the foot.